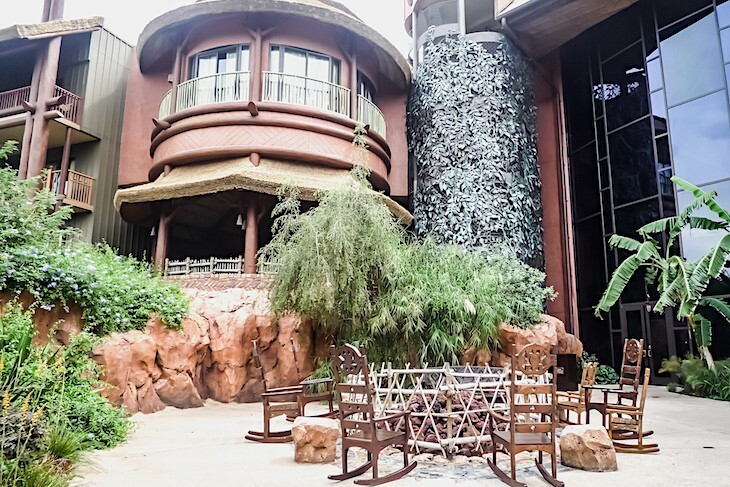 Disney’s version of a safari lodge is certainly thrilling and respectfully faithful to African wildlife, culture, and cuisine. Its authentic architecture combined with grasslands filled with hundreds of roaming exotic animals makes for one of Disney’s best resorts. The six-story, horseshoe-shaped structure topped with extravagant thatch rooftops is rustically surrounded by eucalyptus fencing and three glorious savannas. 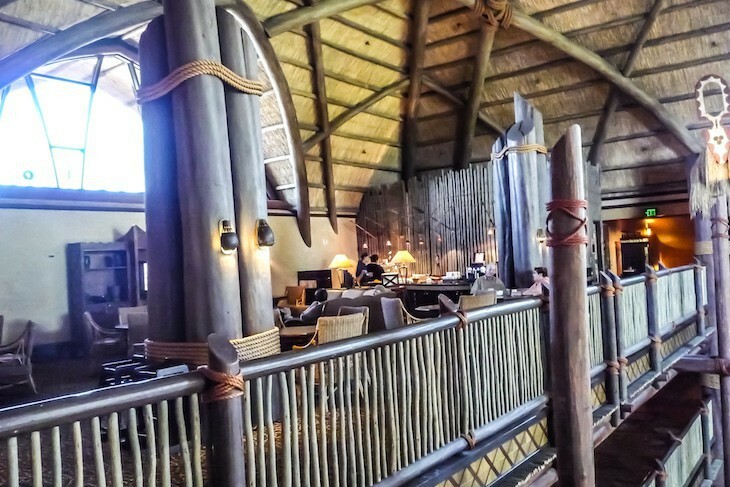 In the imposing, five-story thatch-roofed lobby, just as at Disney’s Wilderness Lodge, the first impression is nothing but wow! 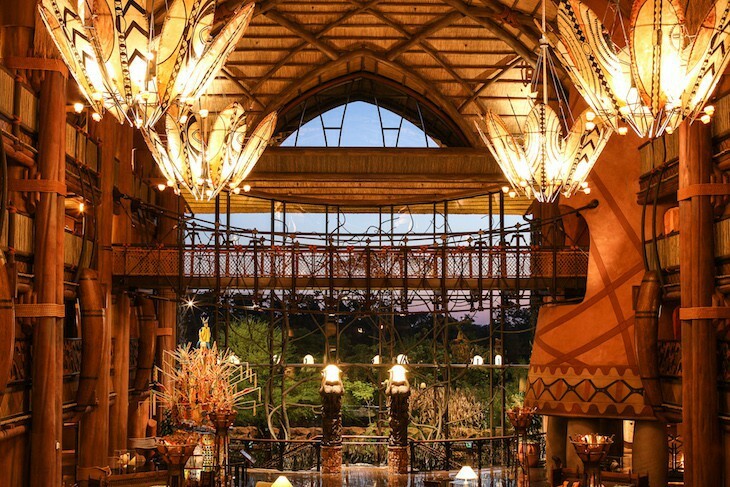 Resplendent overhead chandeliers formed by Masai shields and spears tower over the boulder-lined lobby. 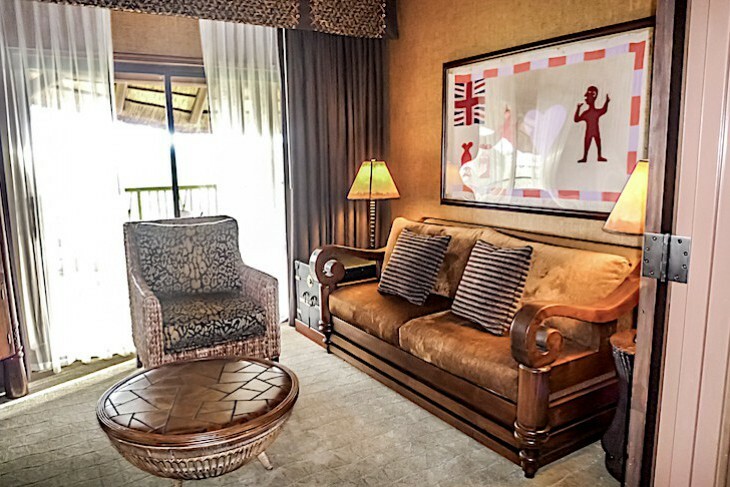 Safari-chic seating areas offer hand-carved coffee tables, handsome hand-woven rugs, richly tinted rattan and cane chairs, and relaxing leather sofas adorned with African textile throw pillows. A rope suspension bridge spans the lobby and draws the eye to balconies carved with graceful antelopes and a 46-foot picture window framed by branches of an intricate ironwork tree. The centerpiece of the lobby is the one-of-a-kind sacred Ijele, a 16-foot, dazzling mask created by the Igbo people of Nigeria. Out back sits a massive yellow flame tree poised atop Arusha Rock, an outcropping with panoramic views of the savanna where a nearby fire pit surrounded by rocking chairs is the site of nightly storytelling by the largely African staff. Many of the lobby and restaurant greeters together with the savanna guides are all cultural representatives from Africa, more than delighted to answer questions or share information and tales of their homeland. Several viewing platforms are staffed by “safari guides” who help with identifying wildlife as well as communicating interesting information about the animals. 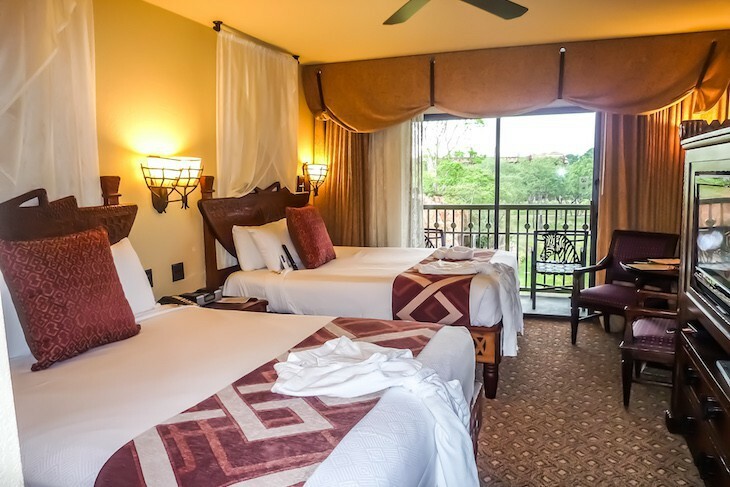 Located within a five-minute drive to Disney's Animal Kingdom® Theme Park (but with no walking path to the park), the animals you’ll see here are exclusively those of the lodge and not part of the theme park’s menagerie. The design is one that encourages observation of the animals from both common lookouts as well as from 75 percent of the rooms. Each savanna holds different species, and patience is sometimes required to spot them. But more times than not you’ll find the savanna brimming with an abundance of prime viewing opportunities including zebras, giraffes, gazelles, ankole (African cattle), wildebeests, exotic birds, and more. 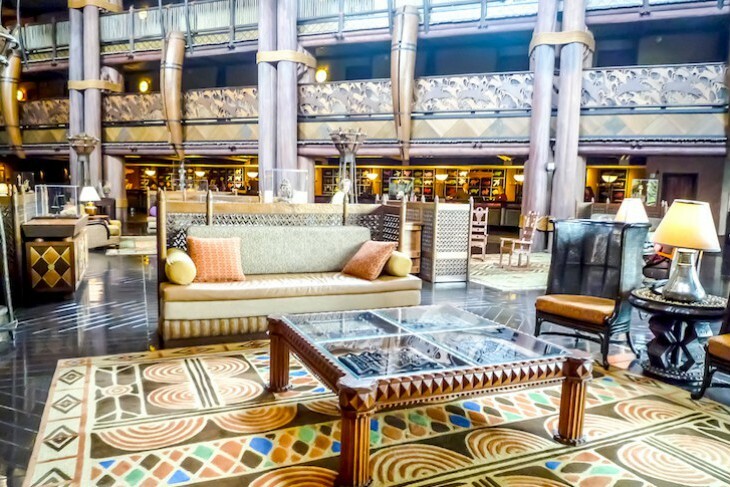 If you can somehow find the time take a tour of the resort’s outstanding collection of more than 500 pieces of museum quality African art, including intricate masks, amazing beadwork, artifacts dating as far back as 8,500 B.C., and much, much more. 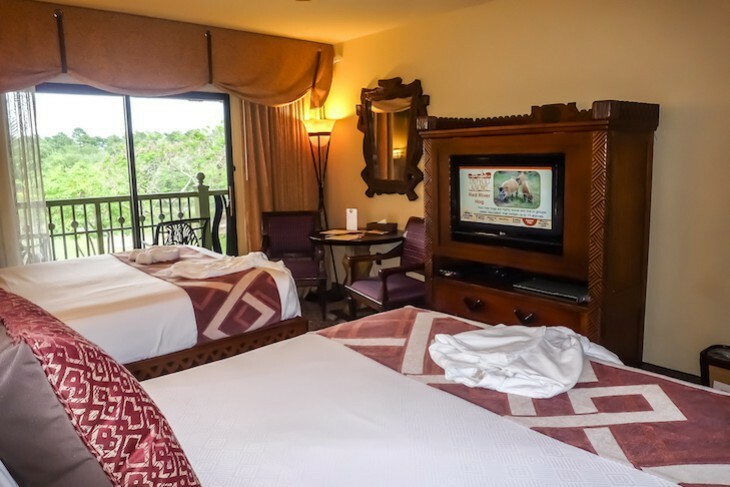 1,186 rooms including Jambo House Villas. 2901 Osceola Parkway, Bay Lake, FL 32830; 407-938-3000; Fax 407-938-7102. Check-in 3 p.m.; Check-out 11 a.m. Here you'll find storytelling on select evenings. The Lodge's savannas are teeming with over thirty species of wildlife. 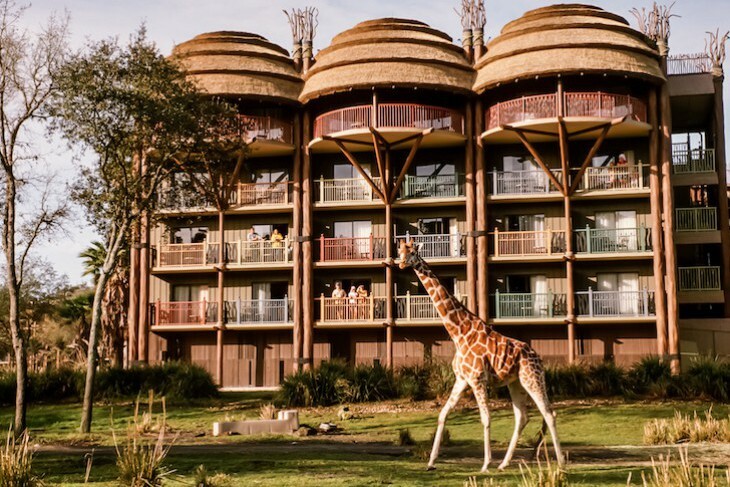 Disney's most amazing suite with its circular thatch roof living area and views of the resort's savanna. 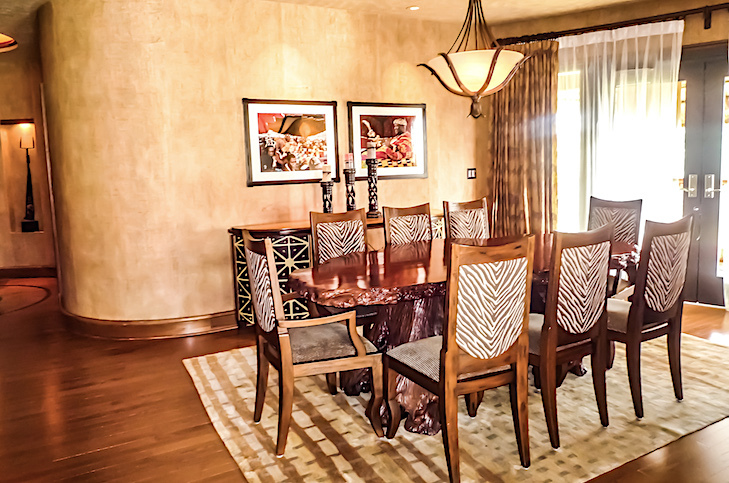 Zebra print chairs and a massive dining table made from a single tree trunk. 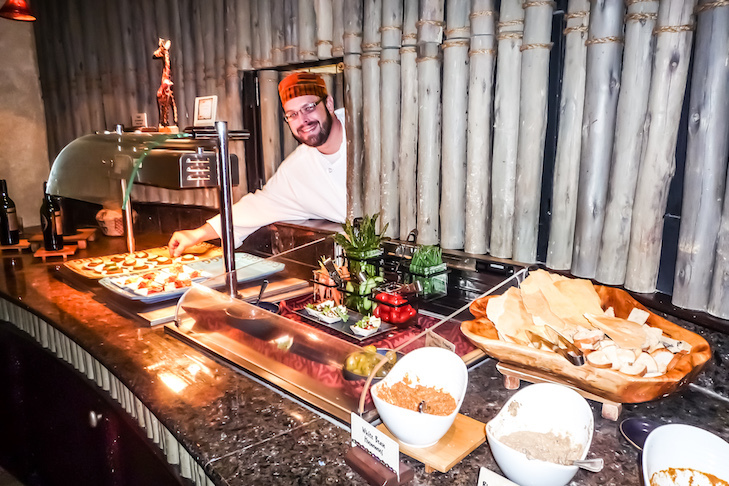 The Animal Kingdom Lodge's great concierge lounge where exotic appetizers and South African wine are par for the course. 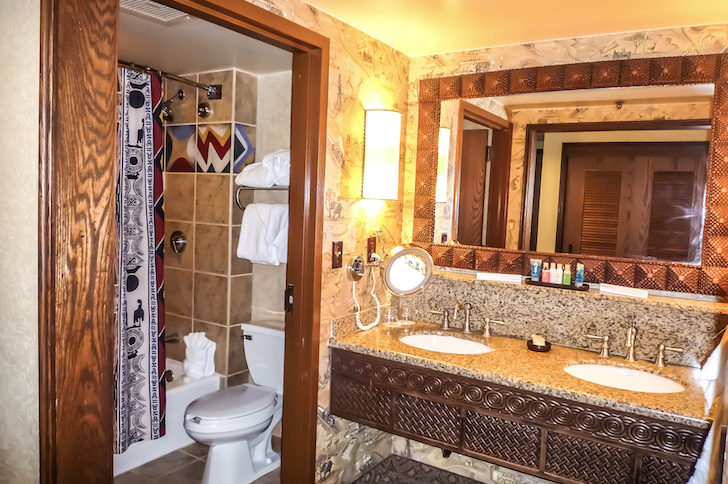 Jambo House Villas lack the extra full bath found over in the Kidani Villas. Open to the living area, the kitchen is small but adequate. A king bed is standard in all. Don’t even consider booking a room without a savanna view, well worth every penny for a front row seat from which to view the animals. And don't forget to bring your binoculars! 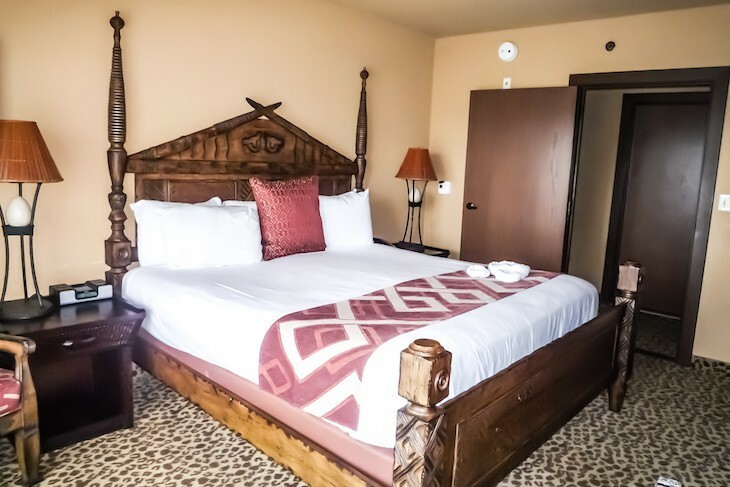 Through a shield-covered door is an attractively designed, honey-colored room outfitted with handcrafted and carved furnishings, torch-shaped lamps, tribal baskets, and ethnic prints. Intricately engraved headboards are draped in a gauzy fabric reminiscent of mosquito netting and beds are covered in white sheeting with a textile African print runner. Flat-screen TVs are built into a bureau (one that really takes up too much room space) flanked by a table and two chairs. Baths have a separate granite-topped vanity area with double sinks, hair dryer, full-length mirror, and too-dim lighting. 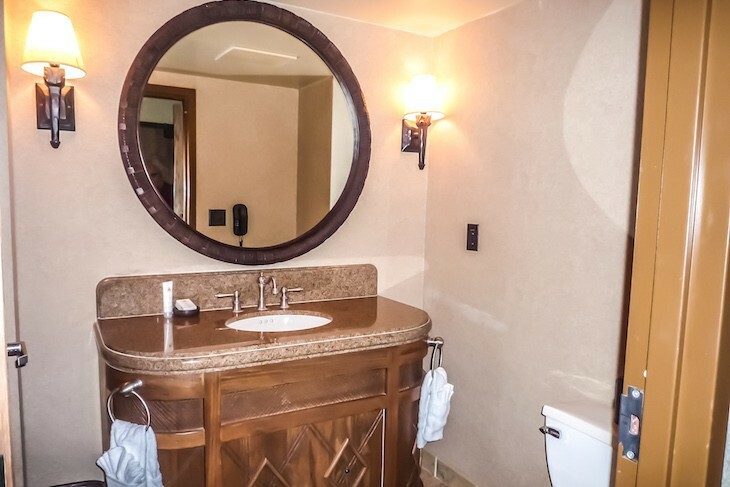 The bathroom walls are papered with maps of Africa, and the vanity holds a wonderful hand-carved mirror. 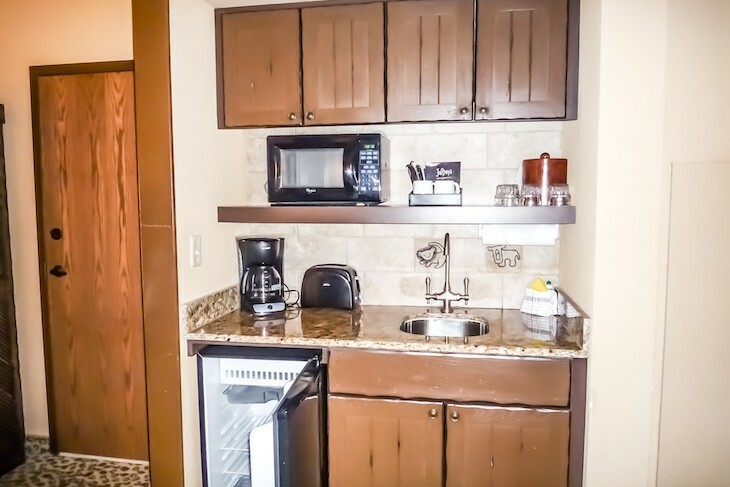 Amenities include an iron and ironing board, keyed safe, refrigerator, coffeemaker, and daily newspaper. Room bedding includes one king, two queens, or a queen-size bed as well as a bunk bed. 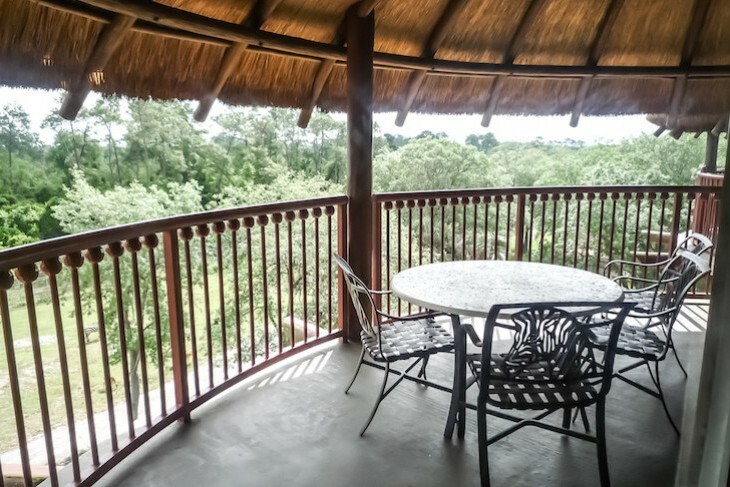 All rooms have balconies, 75 percent of them offering savanna views. However, guest rooms at 344 square feet are a bit cramped. 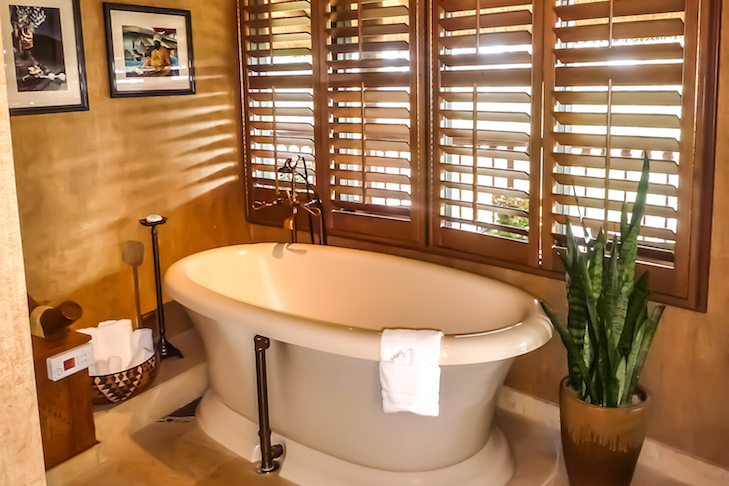 Views are: standard, overlooking the front of the resort and the parking area; pool, overlooking the pool area; and savanna, overlooking one of three savannas with an additional charge for the central Arusha savanna. 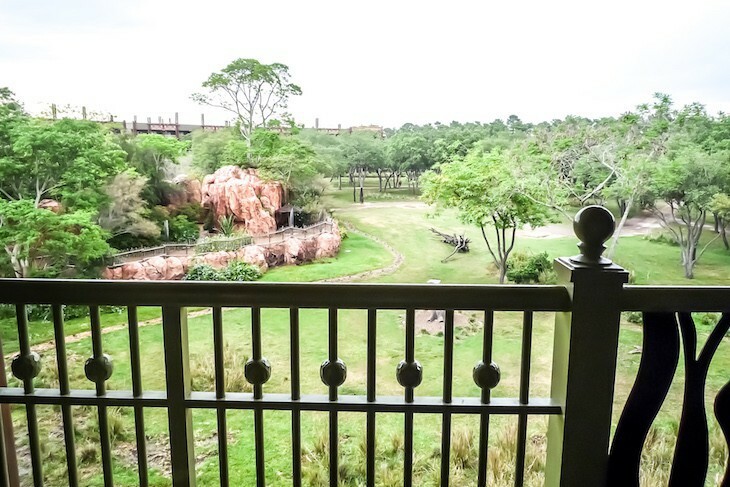 Cara's Tip: At the Animal Kingdom Lodge there are three savannas, each with their own charm. 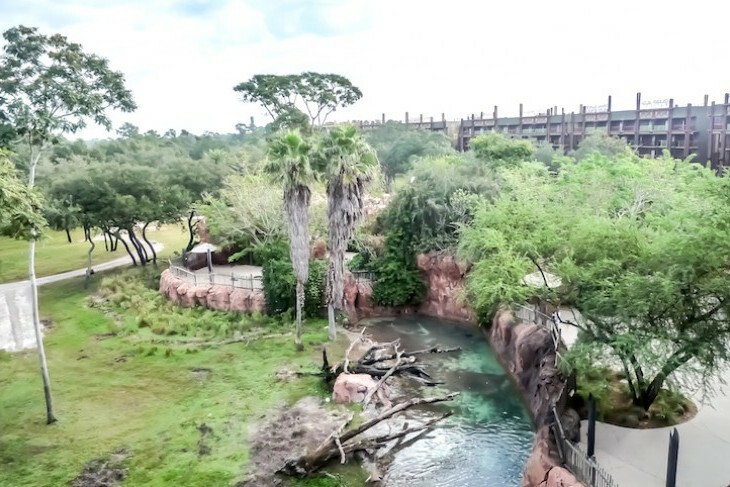 The Kudu Trail savanna facing Disney's Animal Kingdom Villas – Kidani Village is probably my least favorite. Beware the standard view rooms that look at the parking area and could possibly be in the valet parking drop-off area with a constant stream of buses and cars passing by your room balcony at all hours of the day and night. 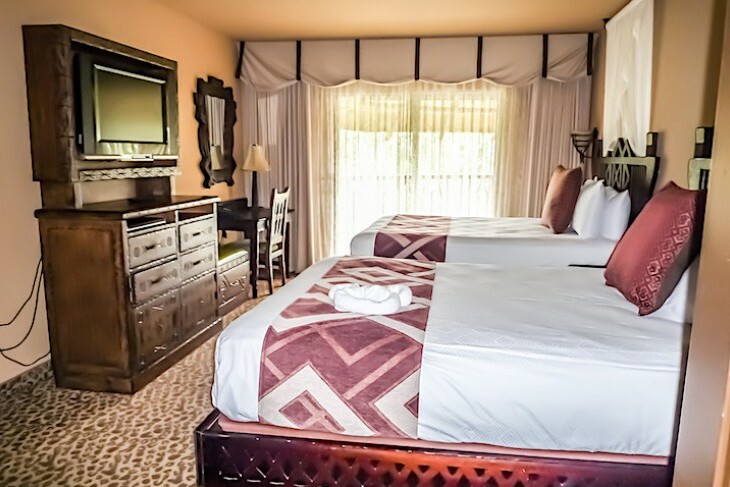 Concierge guest rooms all come with a view of the savanna and are located mostly on the 4th and 5th floor. 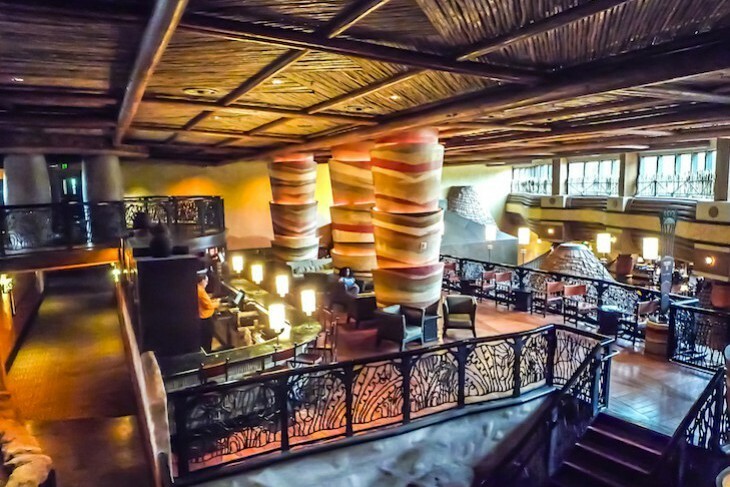 The thatch-roofed, sixth-floor Kilimanjaro Club overlooking the lobby offers delicious and unusual food and a pleasant ambience. 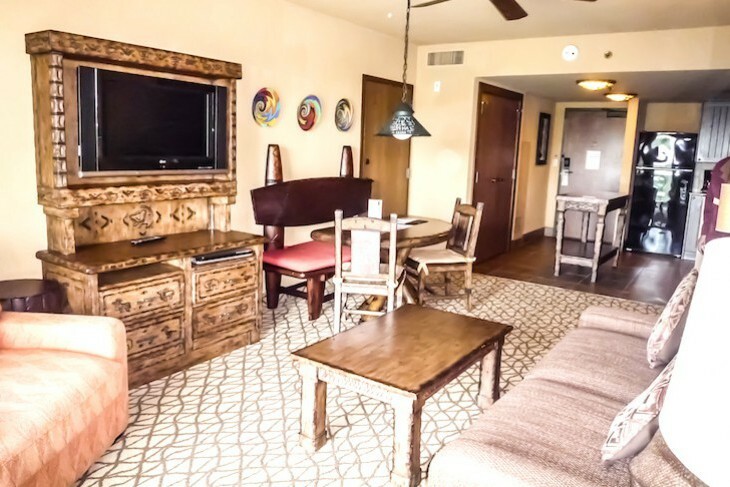 Extra amenities include the services of a concierge staff, and nightly turndown service. Morning brings a continental breakfast of juice, bagels, croissants, muffins, cinnamon rolls, fresh fruit, oatmeal, yogurt, and cereal. Later you’ll find afternoon beverages and snacks of trail mix, yogurt covered pretzels, cookies, granola bars, fruit, goldfish crackers, nuts, and gummy bears, with the addition of scones and tea cookies at teatime. Evening time enjoy South African Indaba Chardonnay, Shiraz, and Merlot in addition to a selection of beer (Sam Adams, Heineken, Bud Light, Tusker, and Yuengling). Appetizers include cold items such as chilled mango-ginger soup, goat cheese peppadew crème brûlée, tabouleh salad with shaved beef, roasted eggplant with goat cheese in phyllo cups, artichoke and curry shrimp, and falafel and cucumber with harissa yogurt; warm items might be mushroom duxelle with goat cheese and toasted flat bread, seafood beignets with sambal dip, lamb patties with tomato jam, African-spiced salmon cake with roasted sweet pepper glaze, vegetable samosas, warm African shrimp pearl couscous, chicken bastille, and turkey bobotie—all from the on-site restaurants, Boma and Jiko. After-dinner treats include cookies, pineapple cheesecake, mini-tarts, Rice Krispies treats, mango-filled phyllo dough, cordials, and sometimes zebra domes (ganache-covered chocolate-coffee mousse) from Boma. Soda, lemonade, iced tea, and Jungle Juice are available throughout the day. You’ll even find a self-service espresso and cappuccino machine. One-bedroom suites at 777-square-feet feature a separate parlor with a queen sofa sleeper, easy chair, coffee table, entertainment center, four-person dining table, wet bar with small refrigerator and microwave, writing desk, half bath, and balcony with savanna view. In the bedroom are two queen beds, entertainment center, vanity desk, and balcony. The bath has a double sink, tub and large shower, too, plus a separate room for the commode. Sleeps six. Two-bedroom suites have the same living room layout, but in the master is a king bed, easy chair and ottoman, and a separate vanity area. A standard-size second bedroom with two queen-size beds, or a queen and a bunk with a standard bath sits off the foyer. Sleeps eight with a savanna view. 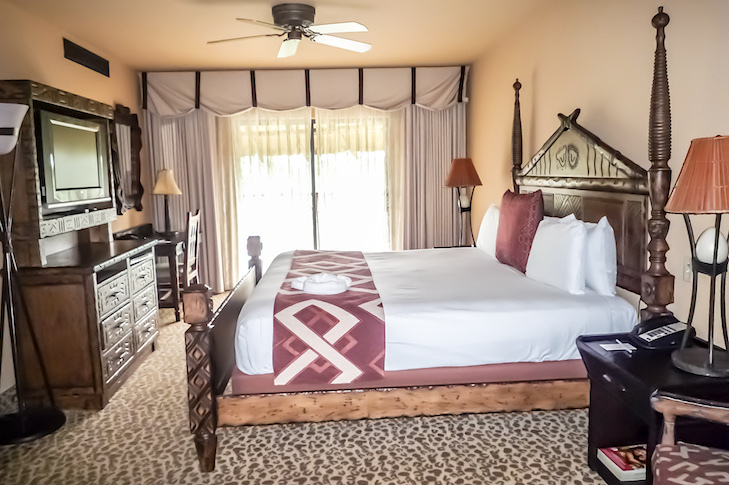 For truly grand surroundings book Disney’s best suite, the two-bedroom, two-and-a-half-bath Royal Assante Presidential Suite with more than 2,115 square feet of exotic luxury. 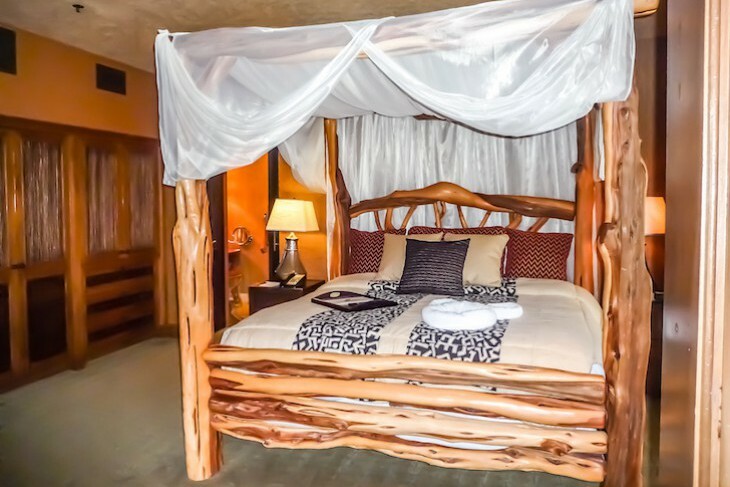 Located on the 5th floor and reminiscent of famous African lodges, it offers panoramic views of the main savanna teeming with exotic wildlife. 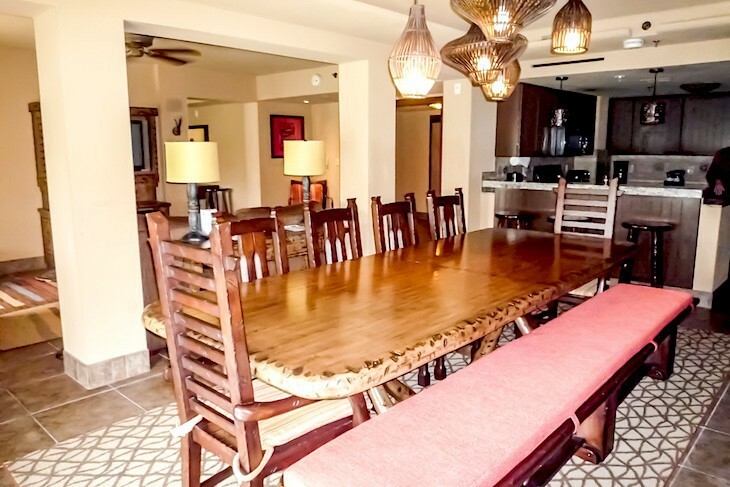 Just off the entry is the dining room boasting a massive table made from a single tree trunk and seating eight in faux zebra-upholstered chairs. 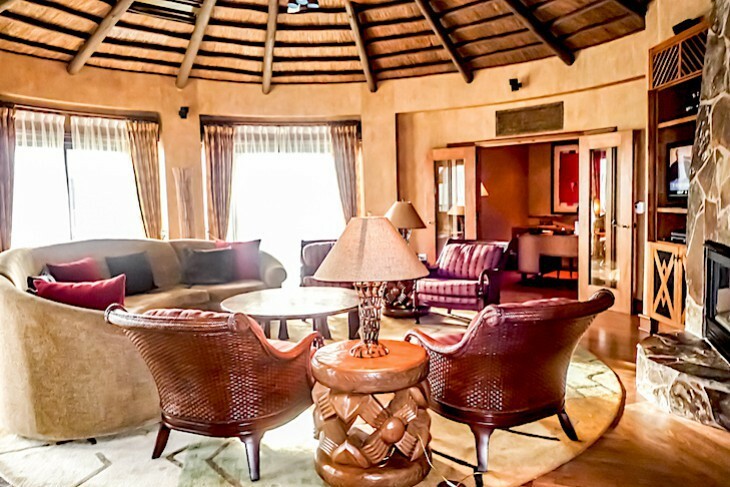 The suite’s highlight is its circular living room with a fascinating thatch ceiling completely surrounded by a stand-up balcony, hardwood and stone flooring, rich African textiles and artwork, rock fireplace, and hand-carved furnishings including an assortment of easy chairs and a curved sofa. The master bedroom comes with a mosquito net-draped king bed composed of tree trunks, a wall of reed built-ins filled with drawers and a flat-screen TV, and a sitting area with sleeper sofa, another TV, and drum-style table. 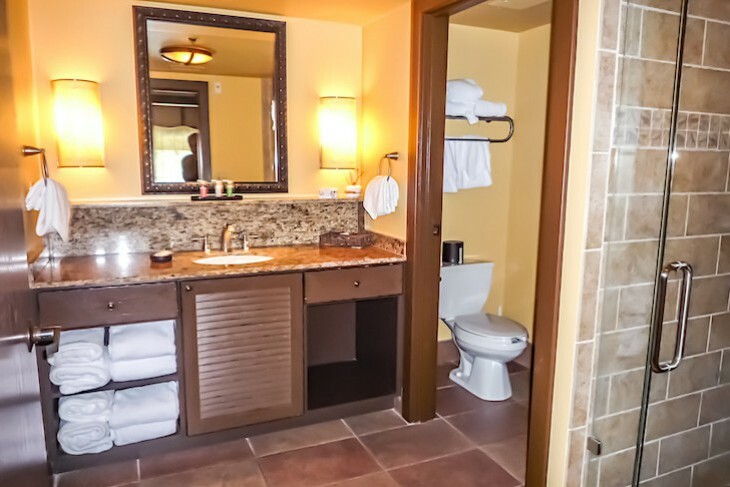 The adjoining bath is one of Disney’s most interesting with its freestanding soaking tub, double sinks, vanity, shower, mini TV, and separate commode and bidet area. The second bedroom is standard size with two queen beds. 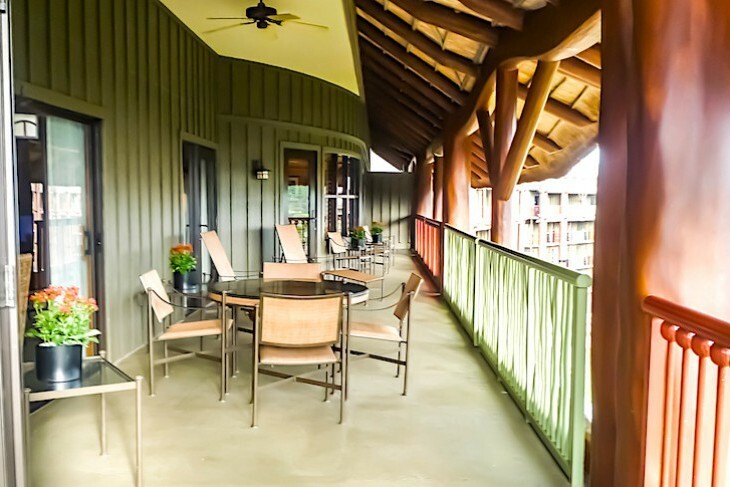 A deep balcony with lounge chairs and outdoor dining table runs the length of both bedrooms and over to the suite’s dining room, perfect for dinner overlooking the savanna. You’ll also find a half bath with a river rock vanity and raised basin, an office featuring a grass cloth and copper clad desk, and a service kitchen with a full-size refrigerator, wet bar, microwave, and separate entry. The two-bedroom, two-and-a-half-bath Royal Kuba Vice Presidential Suite at 1,619 square feet, also located on the 5th floor, is another gem. Similar to the Royal Assante it comes with rooms that are a bit smaller in size and without an office, but with the same amazing décor, thatch ceiling, master bedroom, bath, and balcony. Both the Presidential and VP Suites welcome you with exotic fresh floral arrangements. 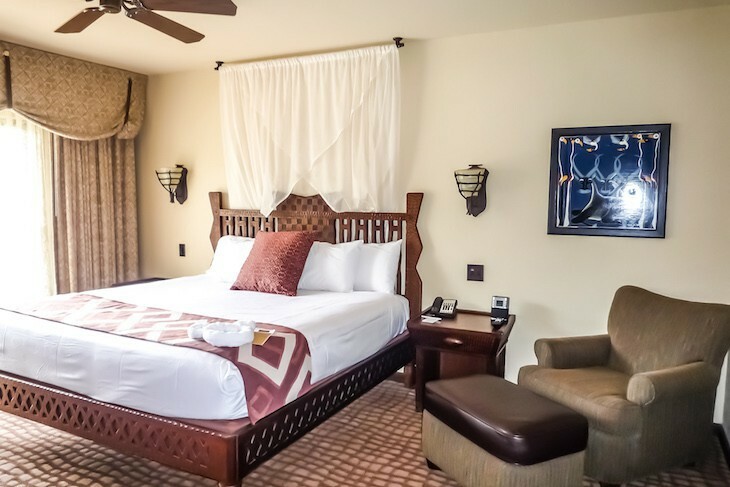 Within Disney's Animal Kingdom Lodge on the 5th or 6th floors are the Jambo House Villas, available in studio, one, two, and three-bedroom units. 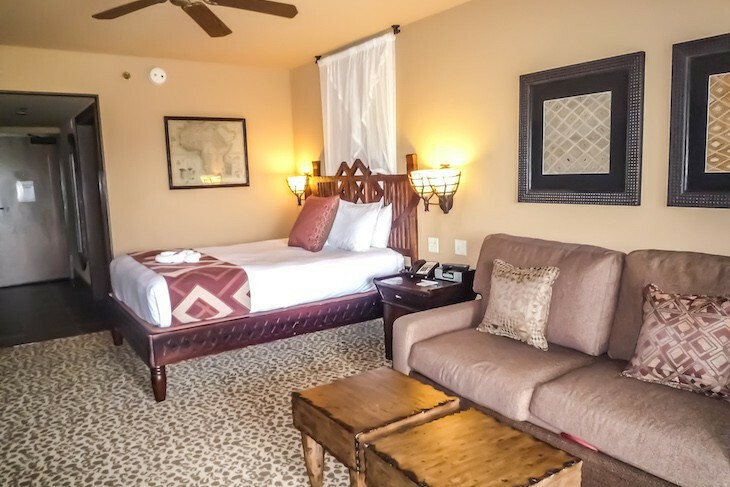 Similar to the lodge’s guest rooms with rich, warm fabrics, lovely carved wood furnishings, and earthy colors, they offer, except for the studios, a small kitchen area and quite a bit more room to spread out than the standard rooms here. 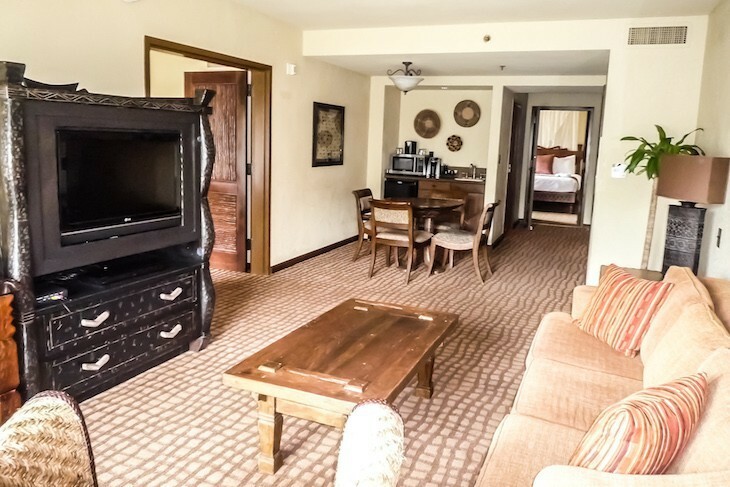 Studios are 316-365 square feet and come with a queen bed, double-size sleeper sofa, table and two chairs, flat-screen TV in a bureau, freestanding armoire closet, and a balcony. 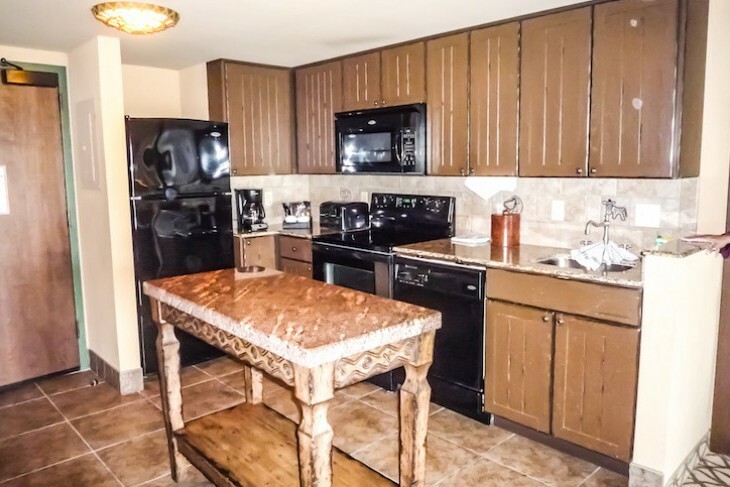 There’s also a wet bar mini-kitchen with microwave, sink, and refrigerator. 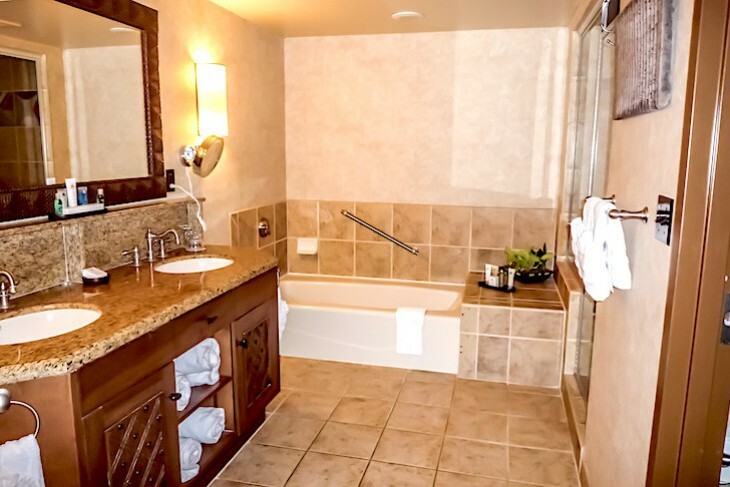 In the bathroom is a tub and double sink with the commode separate. The One-Bedroom Villa has 629-710 square feet. You’ll find a small kitchen with a full-size stove and refrigerator, sink, dishwasher, and kitchen island. The parlor has a chocolate brown queen-size sleeper sofa, oversized, pumpkin-colored sleeper easy chair (except in the Value Villas which are smaller), table with a two-person bench and two chairs, coffee table, flat-screen TV, and balcony. Most sleep five. 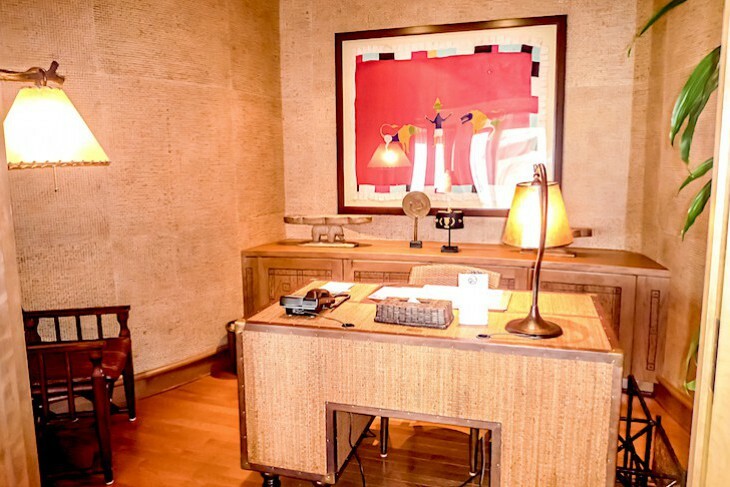 The master comes with a king bed, leopard motif carpeting, bureau with TV, desk, and a second balcony. In the bath are double sinks in a granite vanity, whirlpool bathtub decorated with a setting sun Lion King mural, and separate commode area. There’s also a washer, dryer, and two balconies. 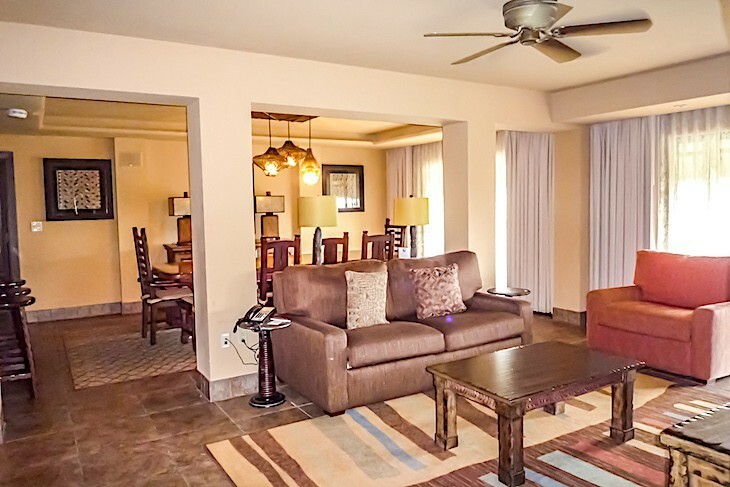 A Two-Bedroom Villa is simply a One-Bedroom plus a connecting Studio with 945-1075 square feet. There are six Grand Villas, each with three bedrooms, four baths in 2,349 square feet. A totally different layout than the next-door Kidani’s Grand Villas, these are on one level and located at the end of the resort’s wings. A combination living and dining room has tile floors topped with colorful rugs, sleeper sofa with two easy chairs and entertainment armoire, and a dining table seating ten. 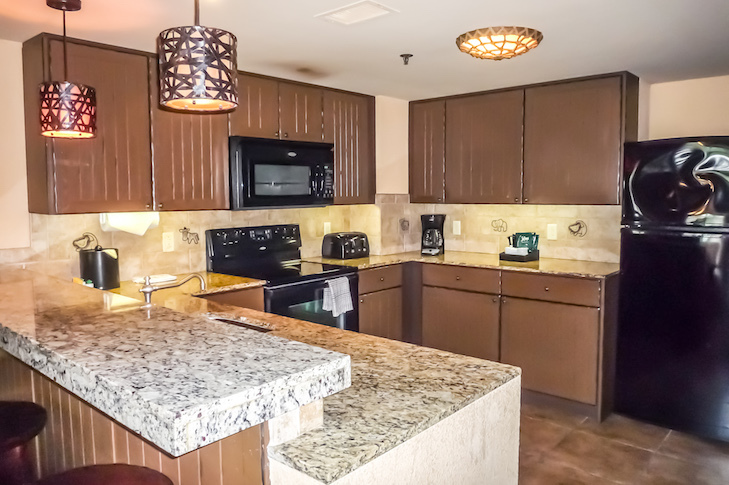 A nice-size granite-top kitchen has a full-size refrigerator, stove, microwave, dishwasher, and sink. There are three balconies—one off the living/dining room, one off the master bedroom, and a shared balcony off the two guest rooms. In the master is a king bed, entertainment center, and desk; its bath comes with a whirlpool tub, shower, double sinks, oversized TV, and separate toilet area. 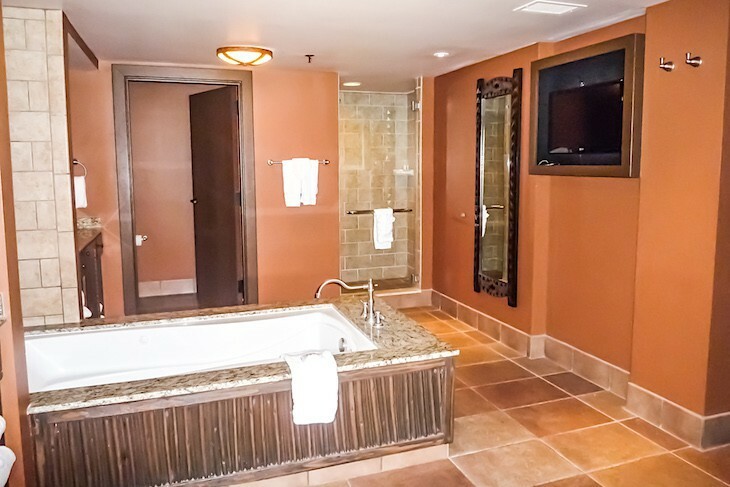 Each of the standard-size guest rooms has two queen beds and their own bath, and a half bath off the entry hall area. A playroom with pool table is exclusive to these villas.